Three core structures, up to three levels in heights, two combining stairs and lifts, the third featuring a lift only. Integration of PCE solution for the cores prior to steel frame construction to provide frame stability. BIM designed to ensure perfect fit during construction on site. All three core structures constructed on site in 12 working days. 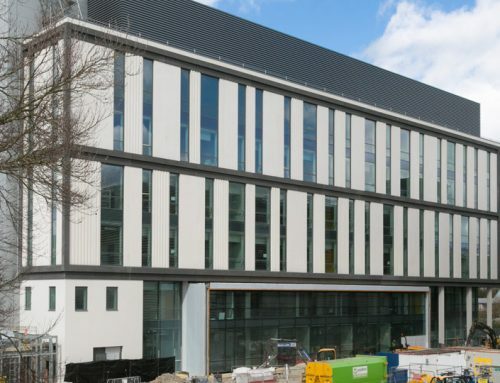 Situated in Cambridgeshire, additional campus buildings continued to be developed and this gave PCE Ltd the opportunity to once again demonstrate the effectiveness of their volumetric box structural core systems for multi-storey framed buildings. PCE’s early involvement was with project manager, De Grey which led to the award of a contract by main contractor Hutton Construction to provide 3 core structures that provide the structural stability for a steel framed building. All three cores (two of them each combining stairs and lifts, the third lift only) were all constructed to full height in less than two and a half working weeks. The fast erection to full height of the cores enabled the subsequent frame contractor to progress their work without delays as well as a reduction in other operatives working on site at the same time thus giving an overall safer working environment. The offsite factory production of the stair and lift shaft boxes ensured the critical internal dimensional accuracy was maintained within the tight tolerance requirements of the finished core structure. PreFastCore, available from PCE, is the ideal system for constructing structural lift, stair and combined lift and stair cores, using offsite engineered precast concrete modular units, providing rapid and safe on site erection to full height. 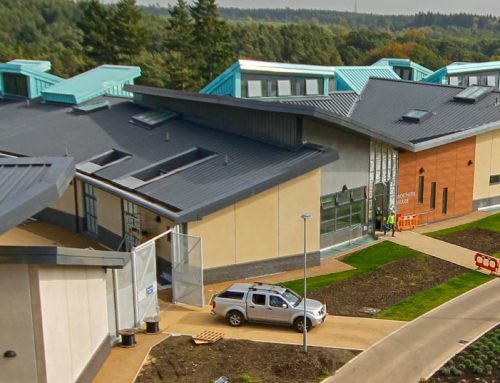 The Babraham Research Campus is acknowledged as a leading research and innovation campus for the UK and is home to both world-class academic research and commercial life-science companies. Constructing the cores using individual wall panel components would have significantly increased onsite programme and costs due to propping and jointing requirements, with the risk of the finished shafts being less accurately constructed.